Jewish Home's Eli Ben-Dahan attacks anti-IDF NGO for spreading claims abroad instead of reporting to proper IDF investigative bodies. 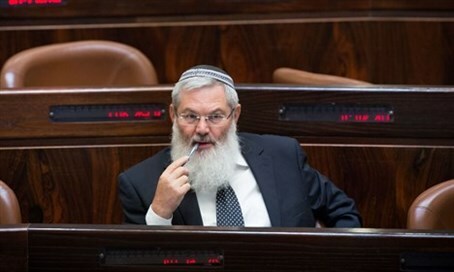 Deputy Defense Minister Rabbi Eli Ben-Dahan (Jewish Home) asserted during a Knesset discussion on anti-IDF NGO Breaking the Silence Wednesday that left-wing incitement on social media has "passed all bounds" in the past few days. "When I see the New Israel Fund refer to the Justice Minister as the 'Minister of Hatred' or when the Prime Minister, Justice Minister and Education Minister are drawn as drooling attack dogs aimed at harming democracy, I think this incitement is dangerous, and we must, all of us, lower the flames and put an end to it," Ben-Dahan stressed. "Breaking the Silence is an NGO, whose core activity is focused on appearances before international audiences, most of whom are anti-Israel," he continued. "Some of the financing of this organization, according to the official registrar's report, comes from foreign countries and agencies funded by foreign governments, among them, the anti-Israel BDS campaign." "There is room to criticize the IDF," Ben-Dahan noted, "but the criticism should be made fairly and honestly. Namely, to provide all known information and sources to the IDF's investigative bodies, who do their jobs honestly and faithfully to investigate every case that steps out of the borders of the commands and spirit of the IDF." "Breaking the Silence does not work that way," the Deputy Defense Minister charged. "A large parts of its claims are anonymous, with no identifying information, nor are they delivered to the IDF's investigative bodies, rather transferred directly to international bodies hostile to Israel and the IDF." "The organization does not cooperate in investigating its claims, preferring to spread these stories unchecked abroad," Ben-Dahan added. "The body represents the interests of more than one anti-Israel foreign donors, and as it was said, this organization receives financial support from external organizations, some of whom deny Israel's right to exist."